. Lu Q, Wang DS, Chen CS, Hu YD, Chen CS. Structure-based optimization of phenylbutyrate-derived histone deacetylase inhibitors. J Med Chem. 2005 Aug 25;48(17):5530-5.
. Kulp SK, Chen CS, Wang DS, Chen CY, Chen CS. Antitumor effects of a novel phenylbutyrate-based histone deacetylase inhibitor, (S)-HDAC-42, in prostate cancer. Clin Cancer Res. 2006 Sep 1;12(17):5199-206. 1. Histone deacetylase inhibitor AR-42 enhances E7-specific CD8⁺ T cell-mediated antitumor immunity induced by therapeutic HPV DNA vaccination. J Mol Med (Berl). 2013 Oct;91(10):1221-31. doi: 10.1007/s00109-013-1054-9. Epub 2013 May 29. The treatment of AR-42 and CRT/E7 DNA vaccine resulted in longer survival, decreased tumor growth and enhanced E7-specific immune response in HPV-16 E7-expressing murine TC-1 tumor-bearing mice compared to AR-42 or CRT/E7 DNA vaccine alone, which indicates AR-42 is capable of enhancing the potency of the CRT/E7 DNA vaccine by improving tumor-specific immune responses and antitumor effects. Moreover, AR-42 increased the surface expression of MHC class I molecules in TC-1 cells and its susceptibility to the cytotoxicity of E7-specific T cells. 2. Increased anti-leukemic activity of decitabine via AR-42-induced upregulation of miR-29b: a novel epigenetic-targeting approach in acute myeloid leukemia. Leukemia. 2013 Apr;27(4):871-8. doi: 10.1038/leu.2012.342. Epub 2012 Nov 26. AR-42 is a potent HDACI in AML that increases miR-29b levels and induces down-regulation of known miR-29n targets. 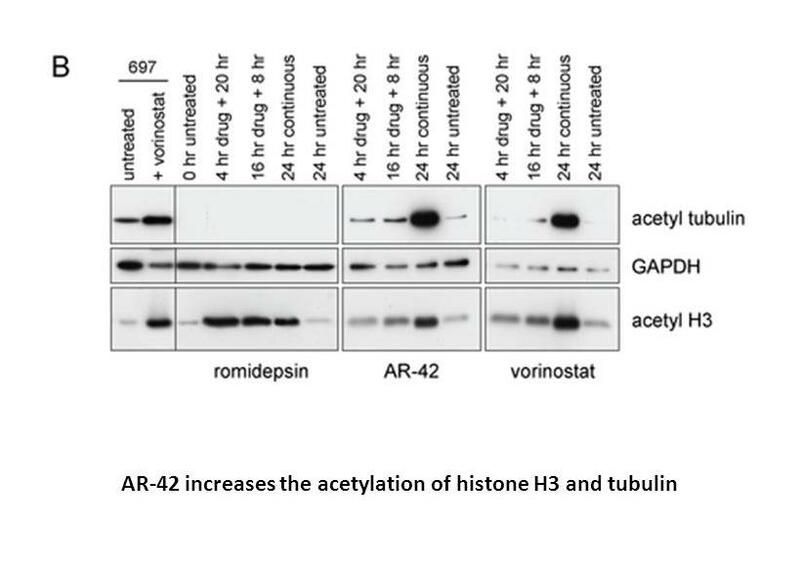 The AR-42-and-then-decitabine regime exhibited stronger anti-leukemic activity in vitro and in vivo than the decitabine-and-then AR-42 regime and each mono-therapy. 3. Histone deacetylase inhibitor AR-42 differentially affects cell-cycle transit in meningeal and meningioma cells, potently inhibiting NF2-deficient meningioma growth. Cancer Res. 2013 Jan 15;73(2):792-803. doi: 10.1158/0008-5472.CAN-12-1888. Epub 2012 Nov 14. Although it inhibited cell proliferation in both Ben-Men-1 and meningeal cells through increasing the expression of p16(INK4A), P21(CIP1/WAF1) and p27(KIP1), AR-42 induced cell arrest at G(2)-M and significantly reduced cyclin B expression in Ben-Men-1 cells whereas induced cell arrest at G(1) and reduced expression of proliferating cell nuclear antigen and cyclins D1, E and A in meningeal cells. Additionally, AR-42 decreased the expression of Aurora A, Aurora B and Bcl(XL),increased Bim expression and caused regression of Ben-Men-1-LucB tumors. 4. The novel histone deacetylase inhibitor, AR-42, inhibits gp130/Stat3 pathway and induces apoptosis and cell cycle arrest in multiple myeloma cells. Int J Cancer. 2011 Jul 1;129(1):204-13. doi: 10.1002/ijc.25660. Epub 2010 Dec 1. 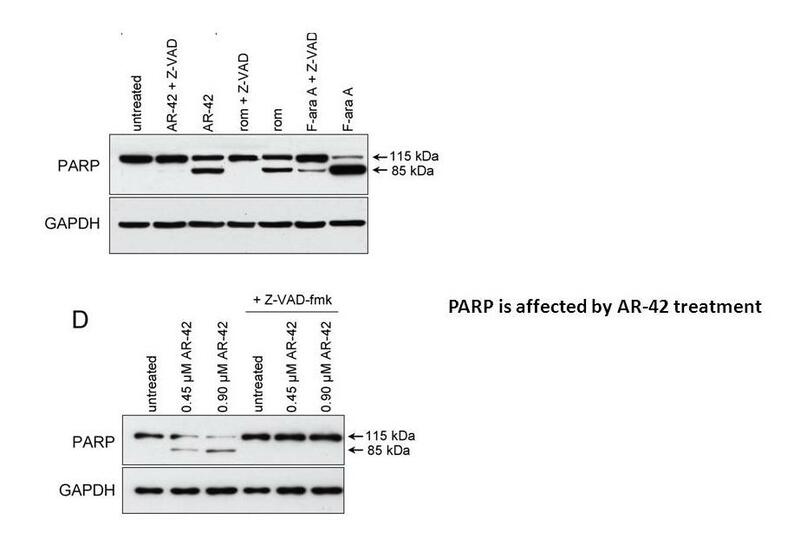 AR-42 exhibited cytotoxicity against MM cells at a mean LC(50) of 0.18 ± 0.06 μmol/l, which induced apoptosis with cleavage of caspases 8,9 and 3 and affected gp130/STAT-3 pathway through down-regulation of expression of gp130 and STAT3-regulated targets and inhibition of STAT3 activation. 5. 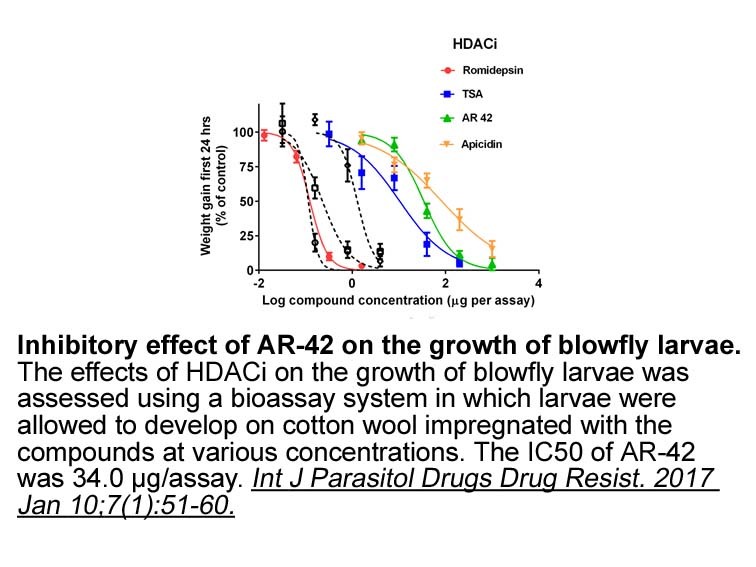 The novel deacetylase inhibitor AR-42 demonstrates pre-clinical activity in B-cell malignancies in vitro and in vivo. PLoS One. 2010 Jun 3;5(6):e10941. doi: 10.1371/journal.pone.0010941. 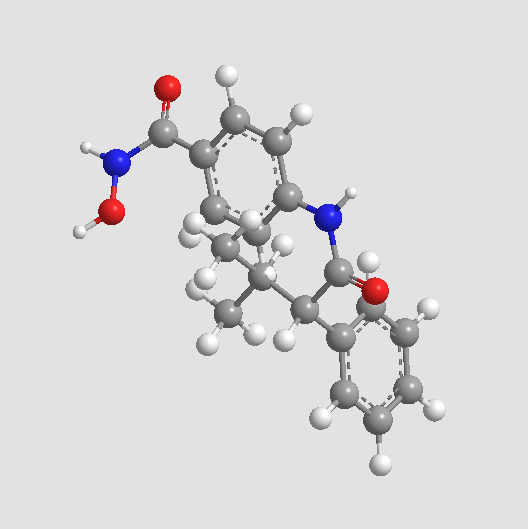 AR-42, a novel DAC inhibitor, was evaluated for its efficacy to treat B-cell malignancies. Aaron M. Sargeant, Robert C. Rengel, Samuel K. Kulp, et al. 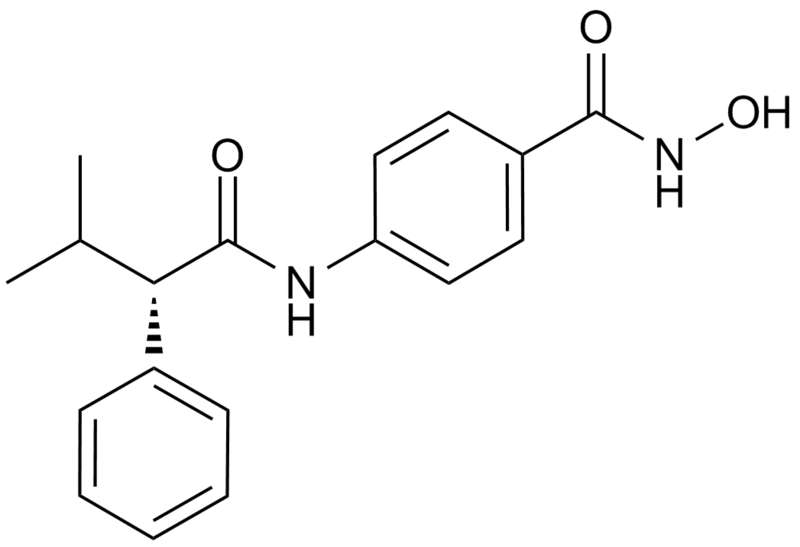 OSU-HDAC42, a Histone Deacetylase Inhibitor, Blocks Prostate Tumor Progression in the Transgenic Adenocarcinoma of the Mouse Prostate Model Cancer Res 2008;68:3999-4009.